Russia and Egypt support the creation of a broad anti-terrorist coalition, which would include Syria, to fight Islamic State militants, Russian President Vladimir Putin said at a joint media conference with his Egyptian counterpart Abdel el-Sisi. “We underline the fundamental importance of the formation of a broad anti-terrorist front involving key international players and regional countries, including Syria,” Putin said on Wednesday. “Every time we meet, the Egyptian people hope to see improvements in the cooperation between us and Russia in different fields, including the economy, but also the fight against terror in a region suffering from terrorism,” Sisi said at the media conference. During Sisi’s visit to Moscow, the heads of states discussed a wide range of issues, including the situation in the Middle East and North Africa, as well as economic cooperation. At their third meeting this year, Putin reiterated Russia’s commitment to include Egypt in the Russian-led Eurasian Economic Union (EAEU) free trade zone. He repeated that the two countries intend to exclude the US dollar and use their own national currencies to settle accounts in bilateral trade. “We agreed to jointly foster efforts in order to weaken the impact of external factors and bring the turnover of goods to a sustainable growth trajectory. Practicable establishment of a free trade zone between the EAEU and Egypt, the use of national currencies in mutual settlements, and promotion of investment cooperation are among the specific steps for the incentivization of the economy,” Putin said. Putin added that Egypt has enjoyed wider opportunities in supplying food to Russia since Moscow introduced counter-sanctions related to food imports against some states last year. 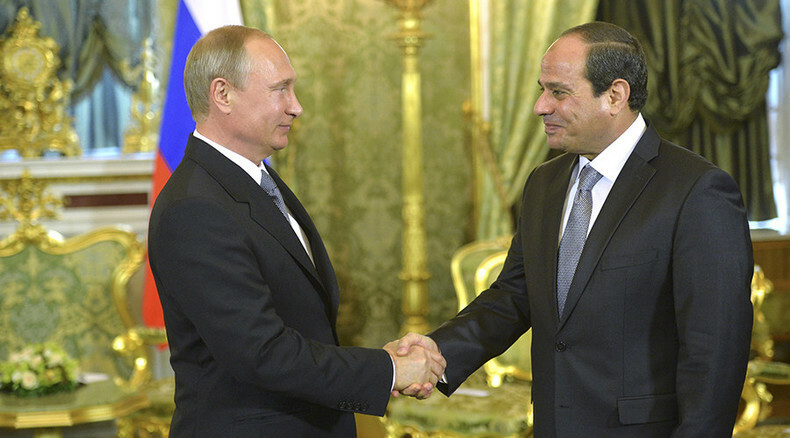 Egypt’s supplies to Russia rose significantly in the first half of 2015, he said. He also announced plans to increase grain deliveries to Egypt. Plans for Russia to participate in the developing of Egypt’s grain infrastructure were also discussed by the heads of state. Grain deliveries from Russia to Egypt amounted to 4 million tons in 2014, which is 40% of Egypt’s total demand, Putin noted. In 2014, there was an 86% increase in bilateral trade compared to 2013, reaching $5.5 billion. The two leaders also discussed joint construction of a nuclear power plant in Egypt using Russian technology, Putin said. “One of the largest bilateral projects is the construction of a nuclear power plant in Egypt using Russian technology. Experts of both countries are completing the development of practical aspects concerning the construction of this station,” Putin said. In February, Putin and Sisi signed several agreements under which Russia committed to help Egypt build a new nuclear power industry. On Wednesday, Putin hinted that Russia may supply the Sukhoi Superjet 100 aircraft to Egypt. “The issue of deliveries of Sukhoi Superjet aircraft for the needs of the Egyptian national airline is being worked out,” Putin said.